When you move into a new home it can often seem as though there is a long list of things that have to be taken care of. Not only do you have to pack all of your belongings up, transfer your utilities, decorate and arrange for removal company, but there is also a plethora of paperwork that needs to be carried out. With all of this going on there are always some things that get neglected and one of the most common is home security. Home security is incredibly important, especially when you move into a new home. What many people fail to consider is that there could have been several families who have owned the property before them and we can never be certain that every single copy of the door keys has been collected back in and handed over. Add to that the fact that if a security system is already installed, then the previous owners still have the access codes. These are all concerns that should be considered when moving house, especially considering the fact that approximately 4.6% of break ins occur within the first year of living in a property. So, what can people do to boost security when moving house? 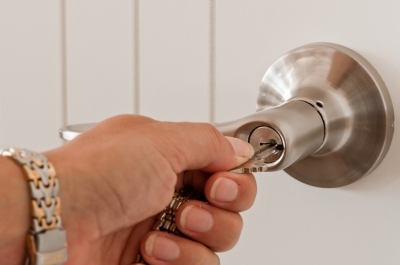 When you move into a new property, ideally you should have the locks replaced as soon as possible. If your budget allows, then you might want to consider choosing patented key locks which will not allow anyone to make copies of the keys without your consent. This is more expensive than standard locks, but many home owners feel that the initial outlay is actually worth it in the long run because of the increased security aspect. Patented locks also allow the current key to be deleted from the system if the keys are ever reported stolen meaning that no-one can copy them. Even if you cannot spring for these more expensive locks, then it is still wise to change the locks and make sure that you only give keys to selected people. Whatever you do, do not put one under a rock outside! When moving into a new property, you might find that there is already a basic security alarm installed. If this is the case then you will need to have the codes changed as soon as you move in so that you know nobody is running around with the codes to disarm your alarm system. You could co one better are replace the security system in the property. This may not be as expensive as you may think, it is possible to get security monitoring systems from ADT and other suppliers for a very affordable weekly fee. Another key step in securing your new home is to check all of the windows to make sure that the latches and/or locks are in good working order. You can also add some additional security features such as spy holes and security chains or even security lights. It is well documented that properties which appear to be poorly maintained are actually more attractive break in targets. When you move into a new home, one of your first priorities should be addressing any outward signs of neglect. This could mean giving the exterior a fresh coat of paint or tidying up the yard. Home security is one of those things that often falls to the bottom of the to do list when moving into a new home. However, it really should be a top priority and with a little care and effort you can soon have your new home nice and secure. Guest post by John Miller. John can be reached at john-miller@outlook.com.